Our new 36 foot deep sea sportfisherman, is recognized as the premier multi-passenger Naples Deep Sea Sportfishing Charter Boat in southwest Florida. We have been operating private deep sea fishing charters for groups of 6 and up to 12 passengers for 23 years. Licensed to carry private parties up to 12 passengers ! The Alabama is also equipped with the latest in electronics including two fish-finders and two global positioning devices to make certain that we are always where the fish are. On-board you will find plenty of comfortable seating as well as a private restroom. When you are back at the Naples City Boat Dock the day’s catch is cleaned and bagged at no charge. What type of fish do we catch? Although we specialize in catching Grouper and Snapper, we also have many sunken ship wrecks that we built to fish for Cobia, Permit, Barracuda, and Jewfish which are catch and release only. Many of these spots are known only to us and the catches often reflect that. Thanks for visiting us on-board the Alabama. 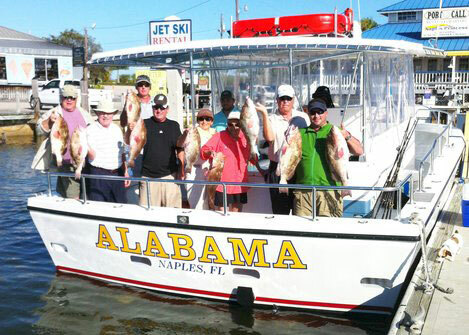 Please remember to bookmark us and come back when ever you desire to book a fishing charter in Naples Florida. We’re happy to serve all your sportfishing needs!